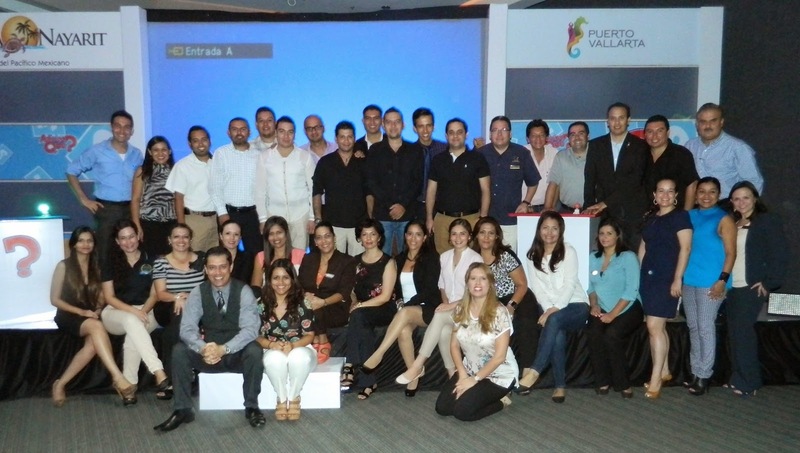 Thirty-two hotels from the Riviera Nayarit and Puerto Vallarta participated in interactive presentations held in Monterrey, Distrito Federal, Puebla and Guadalajara. Promotional seminars held in Mexico by the Riviera Nayarit and the Puerto Vallarta convention and visitors bureaus with a new format called ¿Adivina qué? or Guess what?, have already trained 420 travel agents during the month of May. The agents thoroughly enjoyed themselves while they soaked up information on both destinations. The events were very well received. The recently concluded tour included Monterrey on the 19th, Mexico City on the 26th, Puebla on the 27th and, finally, Guadalajara on the 29th of May. These trainings took place with the collaboration of 32 hotels from the destinations: 14 from the Riviera Nayarit and 18 from Puerto Vallarta. The events began with a trade show where each of the participating hotels had the opportunity to share information with the attending agents about its property (or properties). Afterwards, both destinations held a dinner and a joint presentation. The answers to the game questions were all contained in the information the agents picked up during the trade show. They competed against each other for the highest scores, vying for prizes including stays at hotels in both destinations. According to the poll numbers from the Riviera Nayarit CVB regarding the main states within the Riviera Nayarit’s domestic market, Jalisco occupies first place with Mexico City in third, Nuevo León in sixth and Puebla taking seventh place. This was the driving force behind the visits to the capital cities of these states—including the capital of the Republic—in order to best promote the destinations’ attractions to markets that have already responded favorably with sales. Thus the domestic travel agents received the necessary updates and new information on the destinations, not to mention the exposure received by the hotels located in the Riviera Nayarit and Puerto Vallarta.